Few people know that Connecticut's rich natural resources were not limited to our lakes, rivers, forests and shorelines. Connecticut's complex geologic past provided our forefathers with a substantial mineral legacy. Significant iron ore deposits, copper ore, garnets, marble, limestone, basalt and brownstone all provide or have provided for profitable mining operations in our state at one time or another. While the state's iron and copper industry was long ago eclipsed by the discovery of much larger deposits as young America expanded westward, significant limestone/marble and basaltic traprock operations continue in the state to this day. 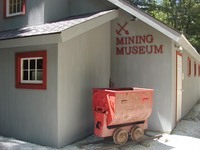 The Museum of Mining is actually located in the midst of a former ironmaking operation. Just south of CAMA's Mining Museum, the remnants of a great iron furnace (Kent Furnace) have been preserved by the State as part of the Eric Sloane Museum. Just north of the the Mining Museum, the early marble quarry that provided the furnace with the necessary flux to smelt iron ore can still be seen. At one time in our past, all of the forested hills surrounding CAMA were literally clear cut to feed the furnace's voracious appetite for charcoal, another key ingredient necessary to smelting iron ore. Nearby steams were dammed to provide the water power necessary to run blowers feeding compressed air to the furnace. Ghosts of the rail siding and foundations of the ironworker's homes can still be made out in the surrounding forest. In addition to the collection of artifacts relating to the iron mining industry, the Mining Museum has collections of noteworthy minerals from throughout the state. Exceptional examples of locally collected amorphous, semi-crystalline, and crystalline minerals provide the viewer with a good idea of what the state has to offer. Displays also inform the viewer about the state's resources of decorative building stone such as brownstone and marble. Did you know that at one time, the state of Connecticut had more than 200 brickmaking companies. As a result of past glaciation periods, many clay deposits dot the state and many of these were exploited to make bricks. The history of brickmaking in the state is explored in a special section of the museum. Native Americans made use of Connecticut's local geologic treasures long before European settlers set foot in this area. A special exhibit shows how the native population made use of locally found quartz, quartzite, soapstone and clay to provide hunting and food preparation tools necessary for their survival. Spend some time at the Mining Museum and explore the many facets of geology, mineralogy and archaeology as they relate to our State. During your visit to CAMA, be sure to put aside time to visit and have some fun while you learn.